It appears that the second peak of the solar maximum has arrived with a vengeance. While activity has been slowly climbing through the tail end of 2013, it was sunspot AR1944 that really put the sun back in the headlines due to elevated radiation levels that forced the scrubbing of an already-postponed first operational launch of Orbital Sciences’ Cygnus cargo ship to the International Space Station. 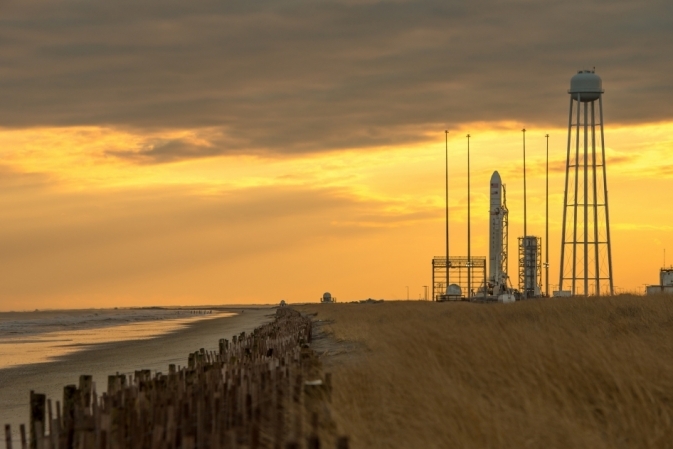 Orbital Sciences’ Antares rocket waits for the solar storm to pass at its launch pad on Wallops Island (Credits: NASA/Bill Ingalls). It is unusual for radiation levels to be high enough to interfere with a launch. In this case, the problem is not so much the spacecraft, which is well equipped to withstand radiation, but the Antares launch vehicle, whose aviation suite does not usually experience such elevated radiation exposure and is not as well protected. Orbital Sciences has since determined that the risk to the launch is acceptable, but the radiation storm now raging around Earth has been upgraded from a moderate S2 to a strong S3, meaning other impacts such as rerouting of polar-flying airplanes are likely to ensue. Although the solar maximum was originally expected to peak in 2013, an unusual pattern of activity mid-year led heliophysicists to predict a double peaked maximum. We are now witnessing the second of those peaks, with the 200,000 km wide AR1944 spewing coronal mass ejections (CME) of which the January 7th X-class flare is just the beginning. Predictions for moderate M-class flares over the next couple days are at 80%, with a 50% chance of severe X-class flares. AR1944 itself is the largest sunspot observed in a decade, according to spaceweather.com, massive enough to swallow up three Earths in its core. Meanwhile, a strong G3 level geomagnetic storm should be passing over the planet January 9-10 and is bound to produce some spectacular aurorae at unusually low latitudes. Stay tuned for more solar action in the days to come. Feature image: Coronagraph of the January 7 X1 solar flare as recorded by the Solar and Heliophysics Observatory (Credits: NASA).